OK OK OK... not like I was gonna! First up, Boots & Bourbon. The Black & Blue Burger: Ground beef, Cajun seasoning, blue cheese, and fried onion strings. I must say, I think Boots & Bourbon did an over all amazing job for Burger Day. Their food was fresh (and delicious), their staff was great and they marketed their restaurant fairly well. One of the ladies went out of her way to hand me my burger first, because, well... "ladies first." Can't be mad at that, non? I even like the little wrapping paper the burgers came in... it was a nice touch! 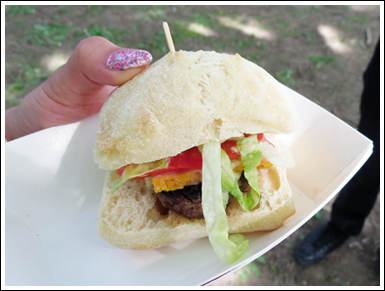 Great theme and great, flavourful burgers: 3.5 stilettos. Korean short rib-burger topped with kimchi slaw, pickled daikon, and spicy karashi. Now, I must admit, I've been to Utopia before for their burgers, but didn't have an opportunity to blog about them. But let me tell you... they were absolutely amazing. Even though they weren't featuring the burger I had previously tried there at this event, I went to their booth anyway. 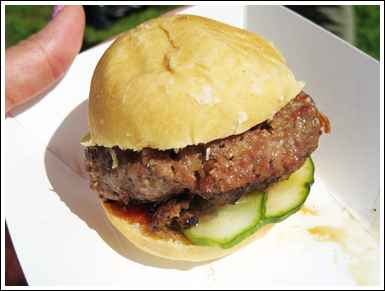 Plus, their burger sounded interesting and adventurous. That it was. I wouldn't say this burger is for everyone, but I had enjoyed it, myself. I just found the kimchi a little bit too spicy and overbearing for this burger, in my opinion. On the plus side, we did get these burgers at a "2 for 1" voucher price. Not too shabby. 3 stilettos. Who's got next? The Citizen. What can I say about The Citizen's burger? Sad to say, but it was sort of unmemorable. Yes, it was good, but not amazing. Having tried many burgers in my tenure, this one didn't quite stand out. I liked the pickles, though... pickles are always good in my books! 2.5 stilettos. Next, none other than Frank. Note: A vegan option was also available, for the same price. What drew me to Frank's booth was their display. It looked clean, modern and artsy fartsy, and how could it not be? It is located within the AGO. So behind all the nice signage and fancy spiced almonds and sandwich pick, how was the actual burger itself? Meh... nothing special. Plus, look at the size of that lettuce! Holy cow, you could make a lettuce wrap from that thing. Nice, but not oustanding enough to deserve a higher rating than 2.5 stilettos. Look who's up... Fidel Gastro's Lisa Marie. Burger stuffed with Nutella (!) and topped with plantain chips and garlic coconut sauce. Now here's a burger worth talking about! Fidel Gastro's Lisa Marie serves a very unorthodox burger: who in their right mind would put Nutella on top of a meat patty?!?! I must admit, I was thinking of my burger boo, Jessica (aka Hepica, aka Heps ♥), from start to finish at this booth... she loooooves Nutella. Ok so after all was said and done, what was the outcome? It was a tasty burger in spite of the crazy toppings, but if I'm getting a burger with Nutella, coconut sauce and plantain chips on it, gosh darnit, I want it to blow my mind! Mind you, the flavours all meld well together, but it was all sort of one note. Impossible, right? Well, no. With that being said, I give Fidel Gastro's Lisa Marie's burger 3.5 stilettos. Naturally raised beef, peameal, cheese curds, Dijon mayo, dill pickle, and lettuce on a Boulart ciabatta bun. Last but not least, we visited The Passenger. 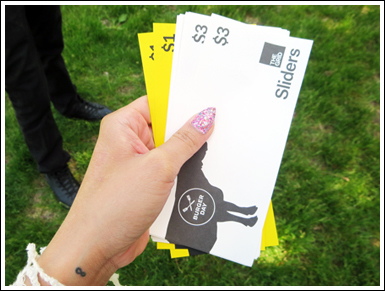 It was nearing the end of the BBQ, and we only had a couple vouchers left. So we walked along the booths looking for something interesting to try, when lo and behold, someone from The Passenger (who had admitted to not even working at this restaurant except for this day) had motioned us over to try their burgers... for free! Yup, I said it, FREE. Who could turn down FREEEEE food?! Nope, not I. So of course I went over and gave it a try. Worst. Mistake. Ever. Okay, maybe that was a little harsh, but after one bite of this burger, I could understand why they were giving it away for free. Everything was cold: patty—cold, cheese—cold, lettuce and tomato—cold and pedestrian, bun—extra cold and hard... and chewy at the same time??? Yikes. This is probably my first ever 1 stiletto rating. Hey, there's a first for everything, right? Given the fact that this was my first ever Burger Day, I think it was quite obvious that although I didn't enjoy each and every burger I tried that day, I still had a lot of fun. 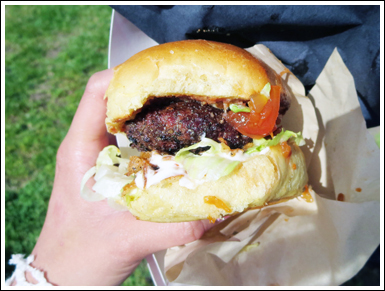 Burger Day is an event for anyone and everyone, because there is truly something out there for each person, ranging from classic burgers, to burger chains, to really adventurous burgers, to vegetarian/vegan burgers. 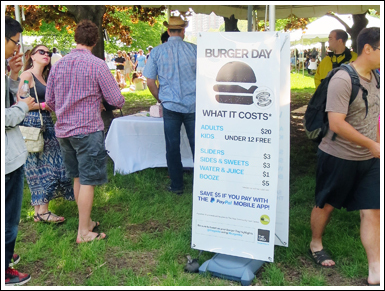 I really challenge anyone to go to this event (next year), and tell me you didn't try at least one burger. Funny enough, although I had already tried and blogged the burger special from Toma Burger Addiction, I must confess that a percentage of our vouchers went to this booth. 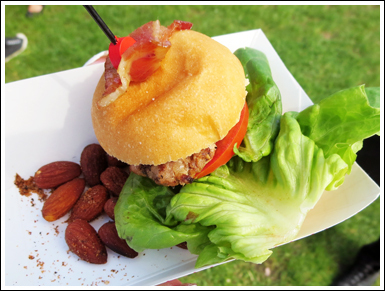 If you ask me, I'd say they had the best burger, hands down, for Burger Day... félicitations! I have noticed one thing, though. This was my lesson learned: visiting burger joints/restaurants > trying their burgers at a BBQ... I'm sorry! With that being said, I do plan on going back to Burger Day next year. I wouldn't be the burger connoisseur that I am if I didn't, now would I? ♥ Thanks for reading!